For the U.S. motion picture industry, see Cinema of the United States. For other uses, see Hollywood (disambiguation). "Tinseltown" redirects here. For the book by William J. Mann, see Tinseltown: Murder, Morphine, and Madness at the Dawn of Hollywood. Lua error in Module:Effective_protection_level at line 16: attempt to index field 'FlaggedRevs' (a nil value). Lua error in Module:Location_map at line 488: Unable to find the specified location map definition: "Module:Location map/data/United States Los Angeles Central" does not exist. Hollywood is a neighborhood in the central region of Los Angeles, California, notable as the home of the U.S. film industry including several of its historic studios. Its name has come to be a shorthand reference for the industry and the people associated with it. Hollywood was incorporated as a municipality in 1903. It was consolidated with the city of Los Angeles in 1910 and soon thereafter a prominent film industry emerged, eventually becoming the most recognizable film industry in the world. According to the diary of H. J. Whitley, also known as the "Father of Hollywood", on his honeymoon in 1886 he stood at the top of the hill looking out over the valley. Along came a Chinese man in a wagon carrying wood. The man got out of the wagon and bowed. The Chinese man was asked what he was doing and replied, "I holly-wood," meaning 'hauling wood.' H. J. Whitley had an epiphany and decided to name his new town Hollywood. "Holly" would represent England and "wood" would represent his Scottish heritage. Whitley had already started over 100 towns across the western United States. Original 480 acre map of H. J. Whitley property developed by his company, Los Angeles Pacific Boulevard and Development Company. Highland Avenue runs through the center of the property. The square at the lower right hand corner is the Whitley Estate and was not part of the Grand View development. Whitley arranged to buy the 480 acres (190 ha) E.C. Hurd ranch. They agreed on a price and shook hands on the deal. Whitley shared his plans for the new town with General Harrison Gray Otis, publisher of the Los Angeles Times, and Ivar Weid, a prominent businessman in the area. Daeida Wilcox learned of the name Hollywood from Ivar Weid, her neighbor in Holly Canyon (now Lake Hollywood) and a prominent investor and friend of Whitley's. She recommended the same name to her husband, Harvey. H. Wilcox, who had purchased 120 acres on February 1, 1887. It wasn't until August 1887 Wilcox decided to use that name and filed with the Los Angeles County Recorder's office on a deed and parcel map of the property. The early real-estate boom busted at the end of that year. By 1912, major motion-picture companies had set up production near or in Los Angeles. In the early 1900s, most motion picture patents were held by Thomas Edison's Motion Picture Patents Company in New Jersey, and filmmakers were often sued to stop their productions. To escape this, filmmakers began moving out west to Los Angeles, where attempts to enforce Edison's patents were more easily evade, because the Ninth Circuit Court of Appeals–which covered most of Southern California–was known to rule against patent claims. Also, the weather was ideal and there was quick access to various settings. Los Angeles became the capital of the film industry in the United States. The mountains, plains and low land prices made Hollywood a good place to establish film studios. Director D. W. Griffith was the first to make a motion picture in Hollywood. His 17-minute short film In Old California (1910) was filmed for the Biograph Company. Although Hollywood banned movie theaters—of which it had none—before annexation that year, Los Angeles had no such restriction. The first film by a Hollywood studio, Nestor Motion Picture Company, was shot on October 26, 1911. The H. J. Whitley home was used as its set, and the unnamed movie was filmed in the middle of their groves at the corner of Whitley Avenue and Hollywood Boulevard. The first studio in Hollywood, the Nestor Company, was established by the New Jersey–based Centaur Company in a roadhouse at 6121 Sunset Boulevard (the corner of Gower), in October 1911. Four major film companies – Paramount, Warner Bros., RKO, and Columbia – had studios in Hollywood, as did several minor companies and rental studios. In the 1920s, Hollywood was the fifth-largest industry in the nation. By the 1930s, Hollywood studios became fully vertically integrated, as production, distribution and exhibition was controlled by these companies, enabling Hollywood to produce 600 films per year. Hollywood became known as Tinseltown and the "dream factory"  because of the glittering image of the movie industry. Hollywood has since become a major center for film study in the United States. In 1923, a large sign, reading HOLLYWOODLAND, was built in the Hollywood Hills. Its purpose was to advertise a housing development. In 1949, the Hollywood Chamber of Commerce entered a contract with the City of Los Angeles to repair and rebuild the sign. The agreement stipulated that "LAND" be removed to spell "HOLLYWOOD" so the sign would now refer to the district, rather than the housing development. After years of serious decline in the 1980s, many Hollywood landmarks were threatened with demolition. Columbia Square, at the northwest corner of Sunset Boulevard and Gower Street, is part of the ongoing rebirth of Hollywood. The Art Deco-style studio complex completed in 1938, which was once the Hollywood headquarters for CBS, became home to a new generation of broadcasters when cable television networks MTV, Comedy Central, BET and Spike TV consolidated their offices here in 2014 as part of a $420-million office, residential and retail complex. 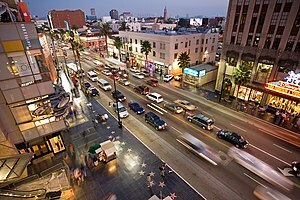 Since 2000, Hollywood has been increasingly gentrified due to revitalization by private enterprise and public planners. According to the Mapping L.A. project of the Los Angeles Times, Hollywood is flanked by Hollywood Hills to the north, Los Feliz to the northeast, East Hollywood or Virgil Village to the east, Larchmont and Hancock Park to the south, Fairfax to the southwest, West Hollywood to the west and Hollywood Hills West to the northwest. KNX was the last radio station to broadcast from Hollywood before it left CBS Columbia Square for a studio in the Miracle Mile in 2005. On January 22, 1947, the first commercial television station west of the Mississippi River, KTLA, began operating in Hollywood. In December of that year, The Public Prosecutor became the first network television series to be filmed in Hollywood.Television stations KTLA and KCET, both on Sunset Boulevard, are the last broadcasters (television or radio) with Hollywood addresses, but KCET has since sold its studios on Sunset and plans to move to another location. KNBC moved in 1962 from the former NBC Radio City Studios at the northeast corner of Sunset Boulevard and Vine Street to NBC Studios in Burbank. KTTV moved in 1996 from its former home at Metromedia Square on Sunset Boulevard to West Los Angeles, and KCOP left its home on La Brea Avenue to join KTTV on the Fox lot. KCBS-TV and KCAL-TV moved from their longtime home at CBS Columbia Square on Sunset Boulevard to a new facility at CBS Studio Center in Studio City. As a neighborhood within the Los Angeles city limits, Hollywood does not have its own municipal government. There was an official, appointed by the Hollywood Chamber of Commerce, who served as an honorary "Mayor of Hollywood" for ceremonial purposes only. Johnny Grant held this position from 1980 until his death on January 9, 2008. The Los Angeles Police Department is responsible for police services. The Hollywood police station is at 1358 N. Wilcox Ave.
Los Angeles Fire Department operates four fire stations – Station 27, 41, 52, and 82 – in the area. The Los Angeles County Department of Health Services operates the Hollywood-Wilshire Health Center in Hollywood. The United States Postal Service operates the Hollywood Post Office, the Hollywood Pavilion Post Office, and the Sunset Post Office. Hollywood is included within the Hollywood United Neighborhood Council (HUNC) Hollywood Hills West Neighborhood Council and the Hollywood Studio District Neighborhood Council. Neighborhood Councils cast advisory votes on such issues as zoning, planning, and other community issues. The council members are voted in by stakeholders, generally defined as anyone living, working, owning property, or belonging to an organization within the boundaries of the council. Hollywood residents aged 25 and older holding a four-year degree amounted to 28% of the population in 2000, about the same as in the county at large. Public schools are operated by the Los Angeles Unified School District (LAUSD). The Will and Ariel Durant Branch and the Frances Howard Goldwyn – Hollywood Regional Branch of the Los Angeles Public Library are in Hollywood. The annual Hollywood Christmas Parade: The 2006 parade on Nov 26 was the 75th edition of the Christmas Parade. The parade goes down Hollywood Boulevard and is broadcast in the Los Angeles area on KTLA, and around the United States on Tribune-owned stations and the WGN superstation. ↑ "Los Angeles Herald, Volume XXXI, Number 45". By the California Digital Newspaper Collection (November 15, 1903). Retrieved February 22, 2014. ↑ "Hollywood Was Once an Alcohol-Free Community". By Rachel Nuwer of smithsonianmag.com. Retrieved February 22, 2014. ↑ Annual Report of the Controller of the City of Los Angeles, California. ByOffice of Controller Los Angeles, CA (1914). Retrieved February 22, 2014. ↑ Report of the Auditor of the City of Los Angeles California of the Financial Affairs of the Corporation in Its Capacity as a City for the Fiscal Year. By Auditor's Office of Los Angeles, CA (1913). Retrieved February 22, 2014. ↑ "Holy Moly How Did Hollywood Get Its name". ↑ "Margaret Virginia Whitley Diary (1886)". ↑ Margaret Leslie Davis,  (1993), p. 92. ↑ Cahuenga Valley Sentinel (May 7, 1904). 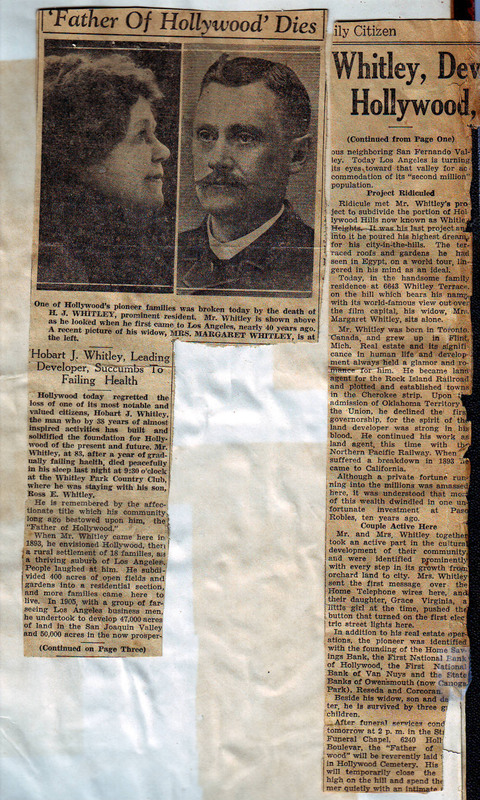 ↑ Hollywood Citizen (Spring Addition March 4, 1914). ↑ Hollywood California | Hollywood History and Information Archived 2011-02-15 at the Wayback Machine. Abouthollywood.com (November 16, 2010). Retrieved on December 11, 2011. ↑ "History of Hollywood, California". Retrieved May 27, 2014. ↑ 19.0 19.1 Mintz, S., and S. McNeil. "Hollywood as History." Digital History. N.p., 2013. Web. May 20, 2014. ↑ Philip French (February 28, 2010). "How 100 years of Hollywood have charted the history of America". The Guardian. UK. Retrieved May 24, 2010. ↑ RASMUSSEN, CECILIA (August 1, 1999). "L.A. Then and Now: Film Pioneer Griffith Rode History to Fame". Los Angeles Times. p. 3. ↑ Dyson, Jonathan (March 4, 2000). "How the West was won Time lapse". The Independent. London (UK). p. 54. ↑ Friedrich, Otto (1986). City of Nets: A Portrait of Hollywood in the 1940s. Berkeley and Los Angeles: University of California Press. p. 6. ISBN 0-520-20949-4. ↑ "Without This Man, Hollywood May Not Exist". YouTube. January 22, 2011. Retrieved January 14, 2014. ↑ "First Hollywood movie filmed on Whitley Estate on October 26, 1911". Cinema Treasures. July 7, 2010. ↑ Robertson (2001), p. 21. It later became the Hollywood Film Laboratory, now called the Hollywood Digital Laboratory. ↑ "Tinseltown". Collins English Dictionary. Retrieved January 14, 2014. ↑ Slide, Anthony (February 25, 2014). The New Historical Dictionary of the American Film Industry. Routledge. p. 94. ISBN 9781135925543. ↑ History of WOF Archived 2010-06-12 at the Wayback Machine hollywoodchamber.net; Hollywood Chamber of Commerce. Retrieved May 31, 2010. ↑ "Kramer First Name Put in Walk of Fame"(abstract). Los Angeles Times, March 29, 1960, p. 15. Full article: LA Times Archives Retrieved June 12, 2010. ↑ Martin, Hugo (February 8, 2010). "Golden milestone for the Hollywood Walk of Fame". Los Angeles Times. Retrieved March 6, 2016. ↑ Vincent, Roger (November 19, 2014). "Viacom signs 12-year lease at Columbia Square in Hollywood". Los Angeles Times. ↑ Kotkin, Joel (Summer 2012). "Let L.A. be L.A." 22 (3). New York City: City Journal. ↑ Lin II,, Rong-Gong; Zahniser, David; Xia, Rosanna (April 30, 2015). "Judge halts Millennium Hollywood skyscraper project". Los Angeles Times. ↑ Vincent, Roger (January 30, 2014). "Vine Street resurgence continues with $285-million mixed-use project". Los Angeles Times. ↑ Grand, Noah (November 5, 2002). "Valley, Hollywood secession measures fail". Daily Bruin. Retrieved December 29, 2013. ↑ 40.0 40.1 ""Central L.A.," Mapping L.A., ''Los Angeles Times''". Projects.latimes.com. Retrieved January 14, 2014. ↑ 41.0 41.1 41.2 41.3 41.4 41.5 41.6 41.7 41.8 41.9 ""Hollywood," Mapping L.A., ''Los Angeles Times''". Projects.latimes.com. Retrieved January 14, 2014. ↑ "About". Whitley Heights. Archived from the original on August 18, 2013. Retrieved January 14, 2014. ↑ "Whitley Heights | Office of Historic Resources, City of Los Angeles". Preservation.lacity.org. Retrieved January 14, 2014. ↑ "Monthly Averages for Los Angeles (90028)". www.weather.com. Retrieved October 31, 2017. ↑ "Population Density". Los Angeles Times. Mapping L.A. Retrieved June 12, 2016. ↑ "Johnny Grant, honorary Hollywood mayor, dies". CNN. January 10, 2008. Retrieved January 12, 2008. ↑ "Hollywood-Wilshire Health Center." Los Angeles County Department of Health Services. Retrieved March 18, 2010. ↑ "Post Office Location – HOLLYWOOD Archived 2010-03-30 at the Wayback Machine." United States Postal Service. Retrieved March 18, 2010. ↑ "Post Office Location – HOLLYWOOD PAVILION Archived 2010-02-27 at the Wayback Machine." United States Postal Service. Retrieved March 18, 2010. ↑ "Post Office Location – SUNSET Archived 2010-03-11 at the Wayback Machine." United States Postal Service. Retrieved March 18, 2010. ↑ "Hollywood United Neighborhood Council". Hollywoodunitednc.org. Retrieved January 14, 2014. ↑ "WELCOME | Hollywood Hills West". Hhwnc.org. December 10, 2013. Retrieved January 14, 2014. ↑ "Hollywood Hills West Neighborhood Council Bylaws - Area Boundaries". Hhwnc.org. February 15, 2012. Archived from the original on January 21, 2014. Retrieved January 14, 2014. ↑ Hollywood Studio District Neighborhood Council (January 1, 2014). "Hollywood Studio District Neighborhood Council". Hsdnc.org. Retrieved January 14, 2014. ↑ "Los Angeles Department of Neighborhood Enpowerment". Done.lacity.org. January 20, 2012. Archived from the original on November 14, 2013. Retrieved January 14, 2014. ↑ "HSDNC.org: FAQs". Archived from the original on 2008-12-08. Wikivoyage has a travel guide for [[Wikivoyage:Hollywood#Lua error in Module:Wikidata at line 863: attempt to index field 'wikibase' (a nil value).|Hollywood]]. This article "Hollywood" is from Wikipedia. The list of its authors can be seen in its historical. Articles copied from Draft Namespace on Wikipedia could be seen on the Draft Namespace of Wikipedia and not main one.